• Obstructive lung disease is diagnosed by demonstrating a ratio of forced expiratory volume at 1 second (FEV,) to forced vital capacity (FVC) (or FEV,/FEV6 ratio) of less than 70%. • Improvement in FEV, of at least 12% and at least 200 mL from prebronchodilator to postbronchodilator is considered evidence of reversibility of airway obstruction. • Restrictive lung disease can be diagnosed using office spirometry if the FVC is reduced to less than 80% of predicted, in the presence of a normal FEV,/FVC ratio (i.e., no obstruction). Pulmonary function testing is essential for detecting lung disease and for differentiating obstructive from restrictive lung disease. Pulmonary function tests (PFTs) may be done in a hospital-based pulmonary function laboratory or, more often, in the outpatient setting using office spirometry. The simplest PFT is the peak expiratory flow rate (PEFR), measured by hand-held mechanical peak-flow meters given to patients for self-management and used in office settings and emergency departments (EDs) for quick assessment during acute exacerbations of asthma. PEFR is the maximum flow generated during expiration performed with maximal force ("Take a deep breath and blow out as hard and as fast as you can"). Previous office spirometry units were bulky and required frequent recalibration, but modern units are small, computerized, and often self-calibrating. Quality of testing is important. The patient should be seated comfortably and instructed appropriately. An adequate PFT must include three valid measures (quick start, good effort, maintenance of forced expiration for at least 6 seconds with no cough) and three relatively similar results (FVC varying by <200 mL). Modified from Hinshaw HC, Murray JF. Diseases of the Chest, 4th ed. Philadelphia, Saunders, 1980, p 23. Results of office spirometry are presented both graphically and numerically, with actual values compared to values predicted by the patient's age, height, and gender. Figure 18-1 shows the points at which two critical values, forced expiratory volume at 1 second (FEVJ and forced vital capacity (FVC), are measured on the time-volume curve. Figure 18-2 shows a typical flow-volume loop for patients that compares normal PFTs with obstructive lung disease and restrictive lung disease (Zoorob et al., 2002). Increasingly, the 6-second end point, or FEV6, is being used as a reliable and reproducible surrogate measure that can replace FVC for patients unable to complete forced expiration beyond 6 seconds. 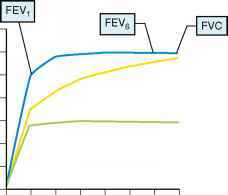 Figure 18-1 Time-volume spirometry curve showing measurement of FEVi, FVC, and FEV6 and curves for obstructive versus restrictive lung disease. time when 25% to 75% of the FVC is exhaled. This measure has been described as representing small airway obstruction, but it is less reproducible and has not been included in clinical guidelines for managing patients with obstructive lung disease. However, MMEF can be an early indicator of lung damage caused by smoking or occupational pneumo-conioses. The FEF25 and FEF75 are moment-in-time measures of expiratory airflow and are therefore subject to significant patient-to-patient variability unrelated to clinical factors. One other dimension of office spirometry in diagnosing and managing obstructive lung disease is to measure these parameters before and after a dose of inhaled beta-2 (p2)-adrenergic agonist is given. Improvement in FEVj of at least 12% and at least 200 mL from prebronchodilator to postbronchodilator measurement is considered evidence of reversibility of airway obstruction. Complete reversibility helps establish the diagnosis of asthma, and it is also useful in guiding therapy by establishing the potential efficacy of medications. For example, some patients with chronic obstructive pulmonary disease (COPD) are more responsive to anticholinergic medications such as inhaled ipratropium, whereas others are more responsive to inhaled p2-agonists such as albuterol. For restrictive lung disease, the "gold-standard" test is the total lung capacity (TLC), which is a measure of maximal exhaled air (FVC) plus residual capacity (RC). However, this can only be tested in pulmonary function laboratories that can test the patient in a sealed chamber. For practical purposes in the primary care setting, restrictive lung disease can be diagnosed using office spirometry if the FVC is reduced to less than 80% of predicted in the presence of a normal FEVj/FVC ratio (i.e., no obstruction). One other test that is available in pulmonary function labs but not in office spi-rometry is the diffusion capacity (DLco), which is a measure of the diffusion of carbon monoxide across the alveolar-capillary membrane. Clinical reductions in DLco can occur with thickening of the alveolocapillary membrane, which can be a sign of interstitial fibrosis.